Energetic, fast-paced, and pumped full of zany humor...sure to entertain the younguns and be fairly painless for their guardians. 90 min. DreamWorks SKG. Directors: Eric Darnell, Tom McGrath. Cast: Ben Stiller, Chris Rock, David Schwimmer, Jada Pinkett-Smith, Sacha Baron Cohen, Bernie Mac, Alec Baldwin, Andy Richter. DreamWorks has a thing for hoisting Disney on its own petard. Just when it seemed as if Mouse House expatriate Jeffrey Katzenberg (the "K" in "DreamWorks SKG") had gotten over his nasty exit from Disney, the mogul who was one of the prime movers of The Lion King greenlit a PDI/Dreamworks animated film that merrily spoofs the Disney hit. Hollywood insider info aside, the sequel to DreamWorks’ Madagascar improves on the limp original. 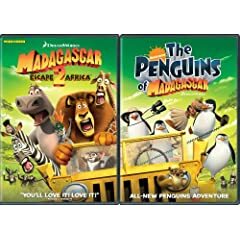 Energetic, fast-paced, and pumped full of zany humor, Madagascar: Escape 2 Africa hardly reinvents the wheel, but it’s sure to entertain the younguns and be fairly painless for their guardians. In Madagascar where we left them, four wayward Central Park Zoo animals--lion Alex (Stiller), zebra Marty (Rock), giraffe Melman (Schwimmer) and hippo Gloria (Smith)--are making final preparations for a flight home on Penguin Airlines: the scariest airline on Earth. The resourceful but poorly informed flightless birds and irrepressible lemur King Julien (Sacha Baron Cohen) only get our New Yorker heroes as far as the Serengeti, where they learn even more stunning rules to their reality. "Our ancestral crib: it's like Roots! ", Marty enthuses. You bet it is: Alex quickly discovers his parents (and his real name Alekay), long lost since the cub was snatched up by poachers and eventually claimed by the zoo. Daddy Zuba (the late Bernie Mac) is the alpha lion, dismayed to discover his son knows all about Bob Fosse, Jerome Robbins and other Broadway choreographers, but nothing about the laws of the wild. His conclusion that his son is not "a real lion" after a disasterous rite of passage (sabotaged by Alec Baldwin's treacherous, power-hungry Makunga) means Alex has plenty to prove if he's to earn respect in his homeland. Meanwhile, the wisecracking zebra with the "Crack-a-lackin'!" catchphrase discovers he's not as unique as he thought: should he join the herd? Gloria entertains the advances of a smooth-talking hippo named Moto Moto (will.i.am hilariously channeling Barry White), helping Melman at last to muster the courage to declare his love for Gloria. Despite its Billy Elliot-esque main plot (code in both films for a broadening of gender roles) and clever tangling of the subplots, Madagascar: Escape 2 Africa lacks depth and the kind of originality that would make it more than a passing fancy. Still, it has all the requisite nice messages, strong character animation, and a high ratio of winning chuckles. 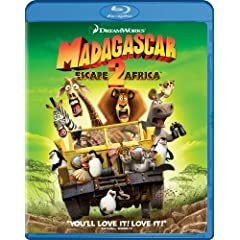 Madagascar: Escape 2 Africa comes to Blu-ray in a breathtaking A/V transfer that excels in color and sharpness, with a Dolby TrueHD 5.1 track delivering the goods in the sound department. As on the fine Kung Fu Panda Blu-ray, this one includes what looks to be signature feature for DreamWorks/PDI animated titles: The Animators' Corner. This Picture-in-Picture track combines the commentary by co-writers/co-directors Tom McGrath & Eric Darnell and producers Mireille Soria & Mark Swift (also available as audio only) with behind-the-scenes footage and production art, like storyboards. There's also a Trivia Track serving up more deets about the movie and its African setting. You'll also find "It's a Family Affair: The Cast of Escape 2 Africa" (9:13, HD). The fast-moving featurette gets comments from Ben Stiller, David Schwimmer, Chris Rock, Jada Pinkett Smith, Andy Richter, Cedric the Entertainer, Swift, Soria, Darnell, Chris Miller, Christopher Knights, McGrath, Alec Baldwin, will.i.am, Willow Smith, and Sherri Shepherd, with footage of the late Bernie Mac (among others) at the mic. "Crash Landing" (3:40, HD) allows Swift, Darnell, head of layout Nol Le Meyer, head of character animation Rex Grignon to reveal the secrets behind the design of the film's action. "African Adventure" (7:18, HD) depicts the animation team's research trip to Africa and methodology of acting out the roles back home in the studio. McGrath, Darnell, Soria, Swift, Grignon, and production designer Kendal Cronkhite-Shaindlin participate. Jambo Jambo: Swahili Speak (HD) is a multi-part tutorial in Swahili words and phrases. "The Bronx Zoo: Madagascar" (8:17, HD) looks at a specialized exhibit at the Bronx Zoo, with Director Jim Breheny, Wildlife Conservation Society President and CEO Steve Sanderson, and Bronx Zoo Director of Planning Sue Chin. Also on hand are two Penguins of Madagascar shorts: "Popcorn Panic" (12:08, HD) and "Gone in a Flash" (12:09, HD). In the category of Mad Music (HD), we get "'Move It, Move It,'" "'Big And Chunky,'" "'She Loves Me,'" "'Traveling Song' Sing Along,", "Alex's Dance Off," and the DreamWorks Animation Jukebox, with selections from Kung Fu Panda, Flushed Away, Over the Hedge, Bee Movie, Madagascar and the Shrek films. One can also Test Flight of Air Penguin Game, check out Trailers, and enjoy a BD-Live hook-up to additional online content. All in all, it's an impressively stocked Blu-ray special edition. All site content © 2000-2019 Peter Canavese. Page generated at 04/20/2019 09:02:34PM.